Just bring out a camera and watch the reaction of people. It can be quite amusing as they quickly sort themselves into distinct groups. I recall many years ago accompanying a professional photographer to one of the company’s industrial sites. Our goal was to get photos of workers doing regular jobs for use in the company’s communication materials. As soon as we would enter a building, we saw the reaction of the first group. They took one look at the camera and headed for the nearest exit as though they were about to catch a fatal disease. I have family members with a similar phobia who end up in ridiculous action shots trying to hide or escape. The rest of the workers either didn’t care or would wander over and try to appear all casual about asking questions. It was painfully obvious they wanted to be chosen as subjects. They were the posers. I find it interesting that wildlife has exactly the same responses. Some creatures can’t beat a trail away from me fast enough while others don’t care or will go out of their way to make themselves look good. I have always been partial to the posers. One of my favourite examples was these mountain goats who almost seemed to read my mind and pause at the best locations so I could take their shot. These posers were naturals. And me? Generally I’m ambivalent if people want to take my photo other than thinking they must be a little hard up for quality subjects! So what camp do you fall in? Now stand there on the ridge … look over at me … I like it. Wow are those hooves ever big. Haha! I’m the same as you, wondering if they are in need of glasses to want me as a subject. I might have guessed that. Not everyone can be posing or there would be nobody left to take the photos. Behind the camera will always be my favourite spot. Dear Lyle, Beautiful pictures of the mountain goats.Their snowy white coats were really pretty to look at. 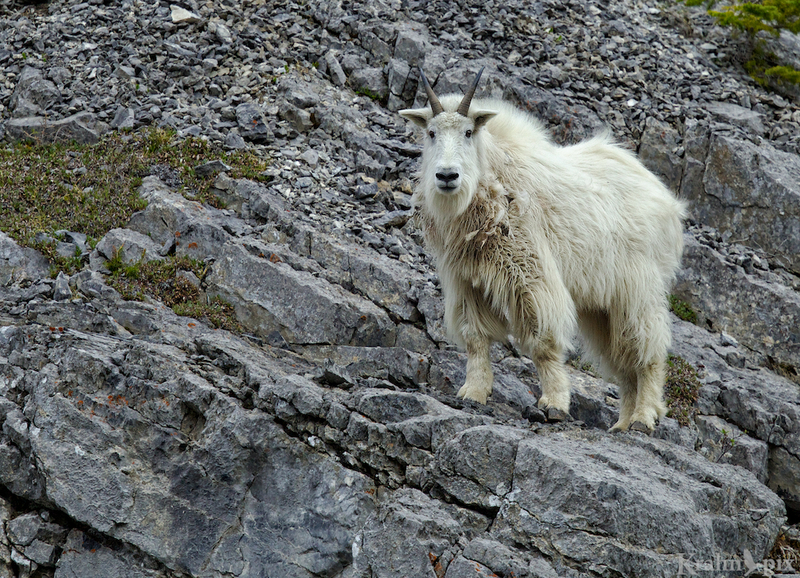 In India the goats seen on the mountain slopes of the Himalyas do not sport a white coat. They are more of a dirtied light cross between white and sandal wood colour.I really and truly enjoyed the lovely shots in the precarious positions.You must not only have had tremendous patience but excellent hold to have shot these pictures.Regards, Ganesh. I agree, the white colour of the mountain goats really sets them off as something special. And their ability to navigate mountain terrain is really something to behold. I was fortunate to find these beautiful creatures. I’m glad you enjoyed them. Another amazing series of shots -with a great narrative to go with them. I always look forward to seeing and reading your posts. Love it. I too, am partial to the posers. As for me, I’m like you: ambivalent I wouldn’t necesarily be interested in a photo of me if I were a tourist. Thanks. You’ve probably got some great wildlife posers in Alaska. I’m very happy to encounter the occasional poser, but I think I’m more happy to be getting candids of those that completely ignore me as if I wasn’t there. Of course back in the old days with the TV news crew in NYC we used to call the camera the A**hole Magnet. Yes I’m quite happy to be ignored by wildlife so I can get the real behaviour. This mountain goat did exactly that. I can only imagine the interesting characters the TV news crew attracted. No wonder it drove you to shooting wildlife. Wow, the first mountain goat shot is phenomenal: totally behavioral shot, screaming this is what a mountain goat is all about and this is the harsh environment it lives in. Great job as usual. When I saw the goat walk up that step, that’s exactly what I was thinking. Such effortless motion in its natural habitat. Glad you liked it too. Are you sure that you didn’t hire a professional model? I watched a video recently of a studio photographer taking photos of a model and was amazed at the continuous monologue of the photographer. Do you provide that kind of constant feedback to your models? I personally try telepathy with my subjects, trying to will them into different poses and locations–it doesn’t work most of the time. I really like the title of this posting. It seems almost deliberately ambiguous, given that the poser can be the subject (the one who poses) or the photographer (one who might pretend to be something or someone he or she is not). The goat professionally ignored me which I thot was quite nice. I understand the telepathy but since it only works for me randomly I’m sure it doesn’t work at all. But hoping is still good. Maybe I should try talking the wildlife into better poses – maybe turn into a goat whisperer, or not. Glad you like the title. There is potential for a lot of posing! Thank you very much. They are beautiful creatures. Hiding behind your own camera is probably the best way to deal with it. I’m sure the Sandra Bullock cameras are about to be invented. I have finally learned to smile when a camera comes out. It took a while, but I didn’t really like the mid-motion, run out of the way shots of me. So, I am a poser, but only if I have to be. The goat did very well though it probably helped that I was so far away I’m not sure he even noticed me. I think the best posing happens when the person just ignores the camera and it’s more natural. So you’re a poser by necessity – interesting. Now, if you want a photo of me you can have it, it’s not big deal, after all. I realized I’m the same man in a picture and for real. I always figure the less I resist getting the photo taken, the more likely it will turn out better. Who knows, it might even turn out better. I’ve had great luck with creature posers including lizards, dragon flies, koi, ducks, goats, cows, butterflies. A poser, yes, I am one. Always ready for my closeup, no matter how scary I look. HA! Nice goat pics. I have a friend who calls blackmail photos goat pics. I could have have guessed you would be one and enjoy creatures who are as well. Blackmail photos – that’s a whole different game. When you are as gorgeous as the white goats you want to be photographed. They have every reason to want to be photographed! When strangers take photos I find that weird and ask the same questions. It depends who is taking the picture…I’m not posing for a stranger although when my mom used to work in a photo studio, she couldn’t take a picture with me..i was moving, blinking, laughing, fooling around. Sounds like that had a lot of potential for an action shot and not too much of a regular portrait.